Emerald Travel is a Communities Travel Unit (CTU) of Emerald Global Ltd., which has been established for over 38 years. Community Travel has always been at the heart of the company, successfully providing economical travel options for returning Thais, Malaysians, Singaporeans, Filipinos, Vietnamese, Chinese, Koreans and Japanese. They have travel consultants who are native speakers across a range of community languages. The Emerald Global group operates from their centrally located West End offices at Regent Street, London, where they employ over 50 staff, represent over 57 airlines, as well as worldwide hotels. The newest addition to the Emerald Global group is their flagship agency store Peoples Travel, which opened in September 2008 and is located at 56 Baker Street. With comfy chairs, video screens and personalised services, peoples travel truly revolutionises the concept of high street travel agency. 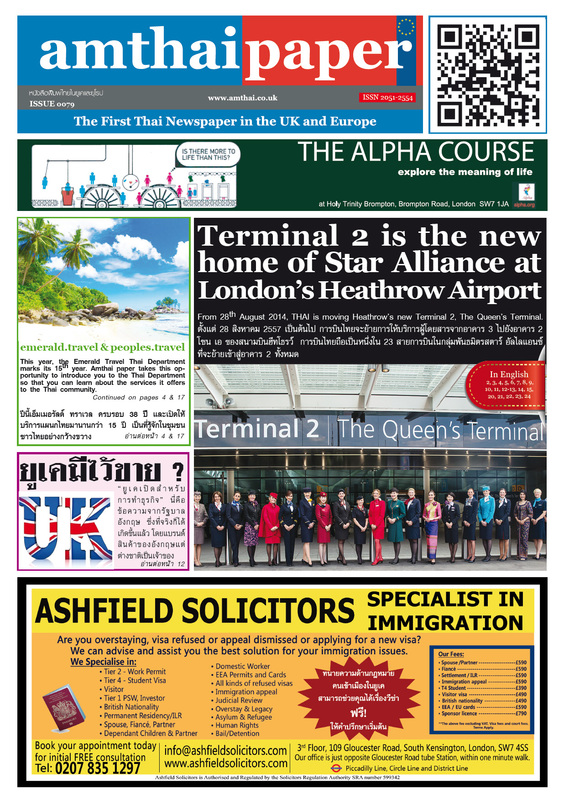 This year, the Emerald Thai department marks its 15th year, Amthaipaper takes this opportunity to introduce you the Thai department so that you can learn about their services for the Thai community. แอมไทย: การบริการแบบนี้ คนไทยจะได้จากทางบริษัทมากกว่า โดยการใช้เวลาซื้อตั๋วจะง่ายและเร็วกว่า ซื้อตั๋วทางออนไลน์ทั่วไป? แอมไทย: คือถ้าไปเที่ยวไม่แค่เฉพาะเมืองไทย สามารถหาตั๋ว transit เที่ยวฟรีได้ โดยไม่ต้องจ่ายสองต่อ?